Grapes: 90% of Nero D’Avola, with organically cultivated international varieties. Harvest period: Hand-picked when the phenolic and technological ripeness is achieved, during the first days of September as regards the Cabernet Sauvignon, and during the second half of September as regards the Nero D’Avola, using bins of 200 kg. Winemaking: After being pressed and de-stemmed, the grapes are macerated in steel tanks at a controlled temperature (24 °C maximum) thanks to which the noble and elegant polyphenolic extractions are obtained, and the aromatic freshness is preserved and amplified. The aging occurs in tonneaux of 500 liters and lasts for 16-18 months and, one month before being bottled, the obtained cuvées are put together and mixed. The refinement continues inside the bottle for 3 additional months before commercialization. ORGANOLEPTIC PROFILE: Intense ruby red colour. On the nose it is clear with captivating notes of cherry and raspberry jam; thanks to a proper refinement inside the bottle, even the tertiary notes of black pepper and chocolate are evident. 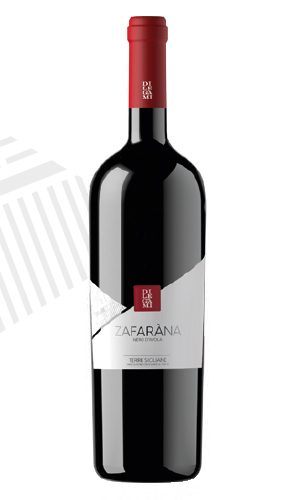 On the palate, its remarkable structure and persistency are noticeable, while being soft, velvety and fairly acid. Suitable for read meats and seasoned cheeses, preferably spicy and strong. To be served at the temperature of 16 °C.